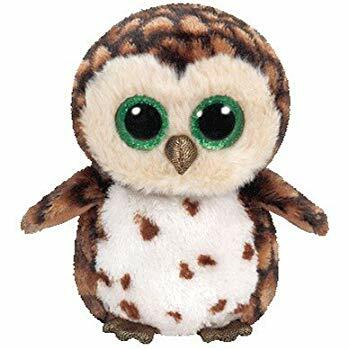 Sammy is a brown owl covered in a dark brown feather pattern. He has large, glittery green button eyes and a shiny gold beak. His face is fluffy and beige. Sammy’s belly is cream-coloured and covered in brown spots and his feet are shiny gold like his beak. I hoot all night but you can’t see me! Sammy was released in December 2015. His Birthday is on 12th June. There are three versions of Sammy. This small 6″ Beanie Boo, a medium 9″ Beanie Boo Buddy and a key clip. Sammy was retired on 31st July 2018.